On 1 November Wycombe Abbey hosted the annual medical conference with Harrow and Radley. The format is that two Sixth Form pupils from each school give a talk on a medical topic of their choice, competing for an impressive cup. It was an exceptional opportunity to learn about a variety of specific subjects in relation to medicine. Amelia started the evening with a presentation on nicotine and the addiction therapy offered by the NHS. The following talks focused on the types, origin and treatments of HIV/ Aids, memory and Alzheimer’s, the ethics of curing aging. The evening concluded with Inarah talking about the causes and treatments for Alopecia. 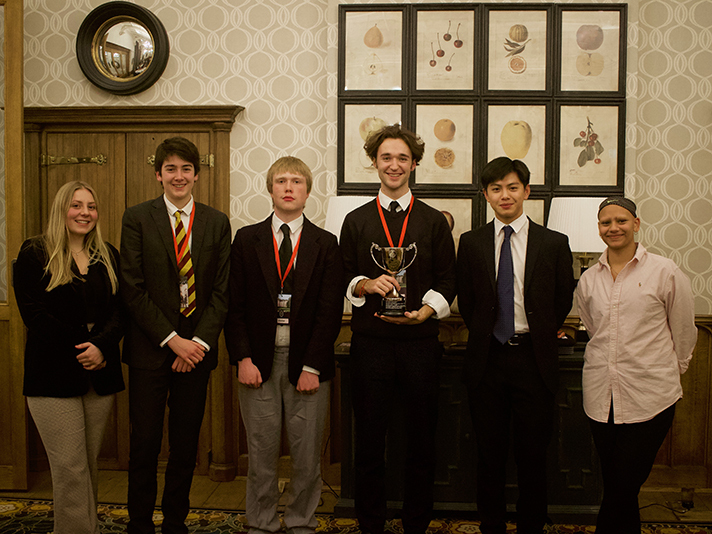 However, first place was given to Jamie from Radley. He presented on the Buruli ulcer caused by the bacteria M. ulcerans. He discussed the detailed mechanisms of our body’s response to a chemical released by this bacterium and concluded with a discussion on how it might have therapeutic value in treating inflammatory diseases. All six presentations from the three participating schools contained a high standard of scientific knowledge and were each presented in their own unique styles and strengths and the short Q&A session after each presentation allowed the audience to explore the deeper knowledge of the speakers. Further discussion continued during dinner, which was also a chance to talk freely about different experiences of the medicine application process or any subjects, amongst people who share a common interest in medicine.